Located on the East Coast of Canada in the beautiful port city of Halifax, Nova Scotia, Saint Mary’s welcomes students from all four corners of the globe: 117 countries to be exact. With a student body that’s over one-third international, our warm and welcoming campus provides a unique opportunity to make global connections and friendships that span continents. Harper’s Bazaar magazine has called Halifax the “hippest little city in North America,” and if you choose to study here, you’ll find out why. With a population of over 400,000 people, Halifax is one of the few cities in Canada that offers an authentic “college town” experience with all the amenities of a large urban center. A safe, friendly, and affordable place to call home, Halifax is also Atlantic Canada’s center of innovation and commerce. Nova Scotia boasts some of the best surfing in North America, and while you’re living at SMU, you’re less than two miles from the ocean. 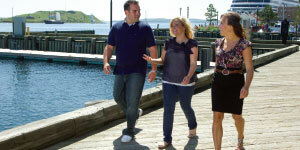 Within minutes of walking, you can check out the Halifax Seaport Farmer’s Market and the downtown city center full oflively pubs and restaurants, while a short drive will have you on pristinebeaches and incredible hiking trails. All students who apply directly from high school are automatically assessed for renewable entrance scholarships. Our entrance awards are merit based and range in total value from $4,000–$16,000 CAD over four years. American students can also use federal student loans (FAFSA) toward their studies at SMU. SMU has a long history of academic excellence dating all the way back to 1802. Over 200 years later, we’re still just as committed to helping students succeed and nurturing the unique potential they possess. 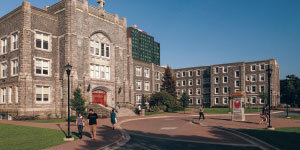 A primarily undergraduate university, Saint Mary’s offers degrees in Humanities and Social Sciences in an innovative Faculty of Arts; Commerce in our AACSB-accredited Sobey School of Business; Science and Engineering in our cutting-edge Faculty of Science; and Environmental Studies in our new School of the Environment. The best part, though? All of ourArts and Commerce (and most Science) majors have a Co-op Education option available to help you go beyond the classroom and experience work in the real world. In addition to Co-op, you’ll find undergraduate research opportunities,lab work, study abroad, and more exciting possibilities to help you enrich your degree.